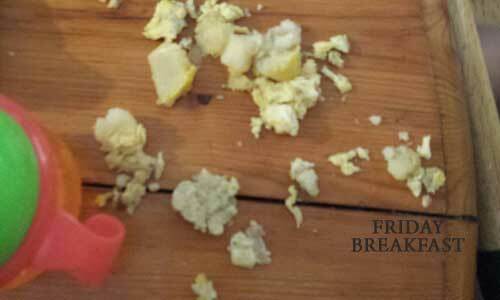 A lot of you let me know that you really enjoyed my post on making baby food the lazy way. I loved sharing the information and hearing about how y'all were encouraged to make your own baby food. 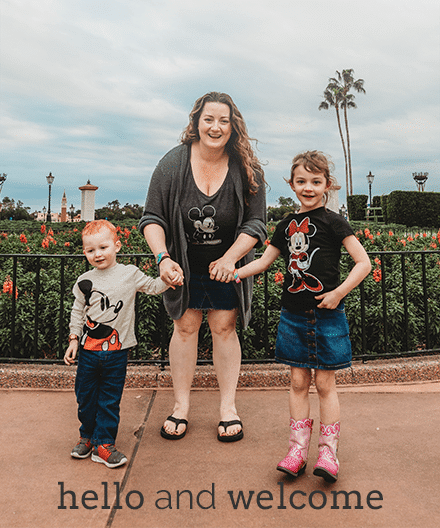 And now… enough time has passed that I'm starting to get questions about feeding a toddler. And since I happen to own have one of those, I decided to record the meals I served her for one week and share them with you. 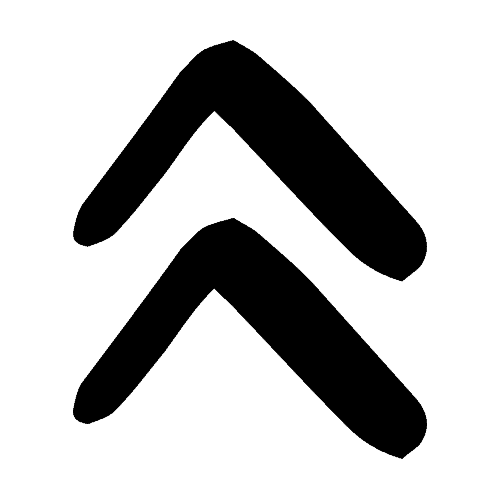 I am not a doctor or nutritionalist. 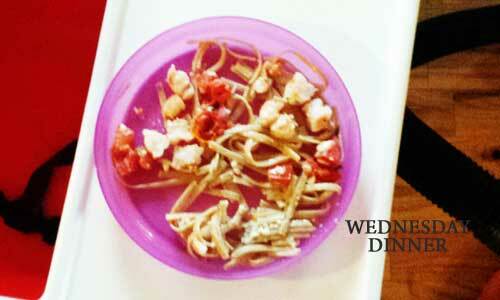 I'm just a mom who's trying to feed her kid the best way she can on a limited budget. I managed to photograph nearly every meal/snack I made for her (with the exception of a few meals we ate outside of the house). Please keep in mind that my daughter is an Eater. She's rarely picky and ALWAYS hungry. So we easily feed her 3 meals a day plus 3-5 small snacks. All meals are accompanied by whole milk and we have several sippy cups of water around the house all day for her to drink (we do not serve her soda or juice) plus she's still nursing 3-5 a day. Sunday Breakfast: Hard boiled egg (she loves the yolk – not so much the whites), plums slices, and shredded whole milk cheddar cheese. 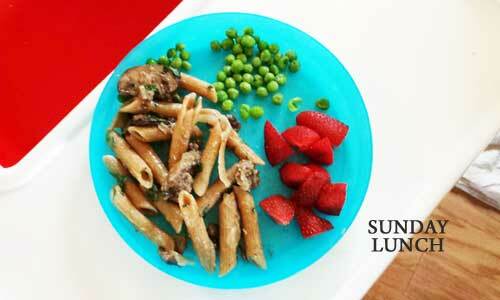 Sunday Lunch: Leftover beef strogenoff, strawberry slices, peas (with a dab of butter). Sunday Dinner: French fries and honey mustard chicken wings (the meat taken off to eat) at Buffalo Wild Wings. 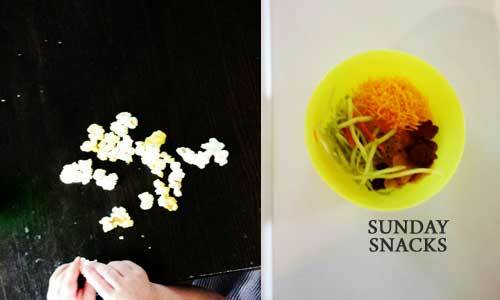 Sunday Snacks: Plain popcorn // Shredded whole milk cheddar cheese, Annie's Homegrown Bunny Graham Friends, raw shredded coleslaw veggies (this is one of those pre-shredded packs form the grocery store without anything added). 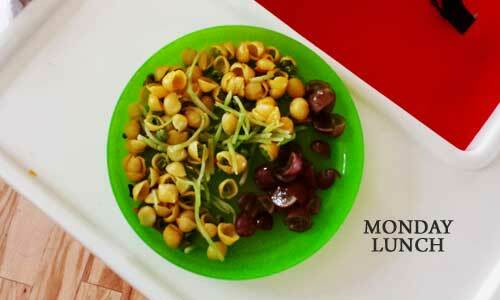 She also snacked on cut-up grapes and dried mango. 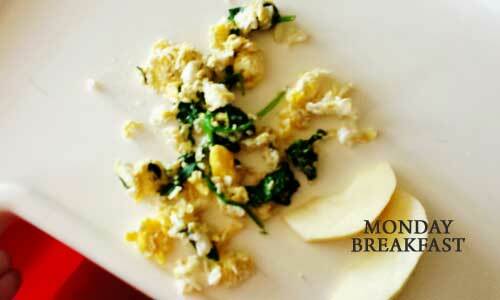 Monday Breakfast: Scrambled eggs with sauteed spinach and feta cheese and apple slices. Monday Lunch: Annie's Homegrown Totally Natural Shells & Real Aged Cheddar Mac & Cheese with peas and sauteed coleslaw mix and cut-up grapes. Monday Dinner: Thai food – spring rolls and egg rolls + sauted mushrooms, red peppers, and white rice. 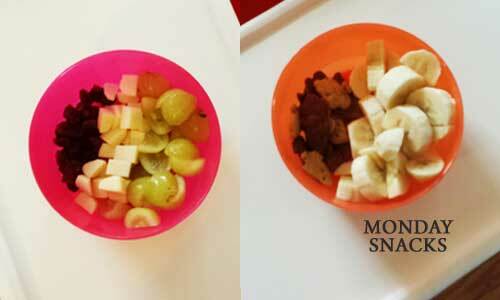 Monday Snacks: Dried cranberries, cut-up string cheese, and cut-up grapes // Annie's Homegrown Bunny Graham Friends and sliced banana. She also snacked on dried mango and shredded whole milk cheddar cheese. 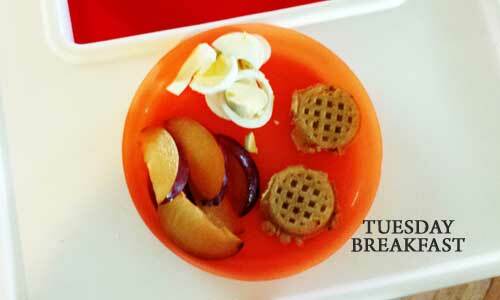 Tuesday Breakfast: Whole Wheat Mini Waffles, hard boiled egg, and plum slices. Tuesday Lunch: Leftover Annie's Homegrown Totally Natural Shells & Real Aged Cheddar Mac & Cheese with peas and plum slices. Tuesday Dinner: Grilled lamb, red peppers, and zucchini with Uncle Ben's Ready Rice, Whole Grain Medley Quinoa & Brown Rice. 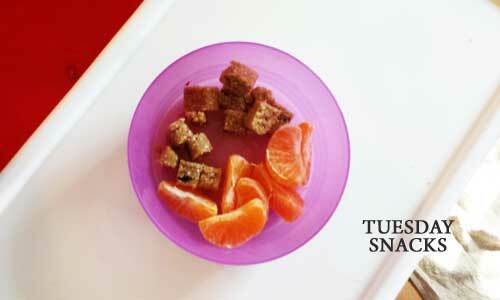 Tuesday Snacks: Granola bar and tangerine. She also snacked on dried mango, string cheese, and dried cranberries. 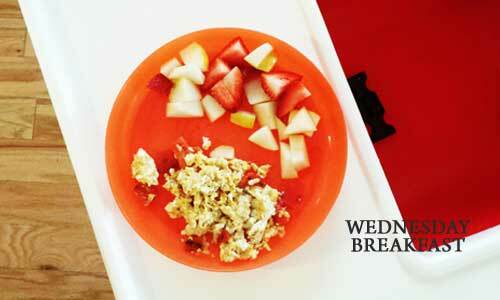 Wednesday Breakfast: Scrambled eggs with feta cheese and cut-up strawberries and pears. Wednesday Lunch: Chicken fetticini alfredo and apple slices. Wednesday Dinner: Whole Wheat pasts with roasted tomato, shrimp, and feta. 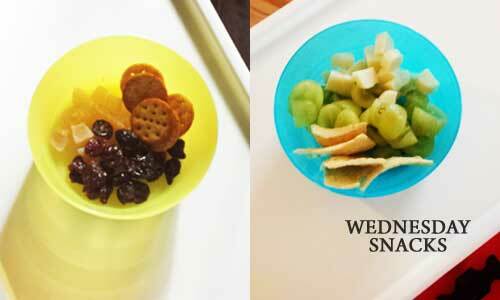 Wednesday Snacks: Dried cranberries, dried pineapple, and whole wheat crackers // cut-up grapes, cut-up string cheese, and lentil crackers. She also snacked on string cheese and tangerine slices. 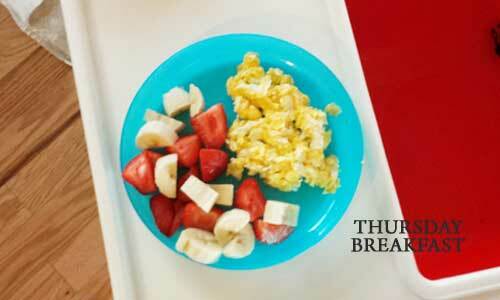 Thursday Breakfast: Scrambled eggs with feta cheese and cut-up strawberries and bananas. 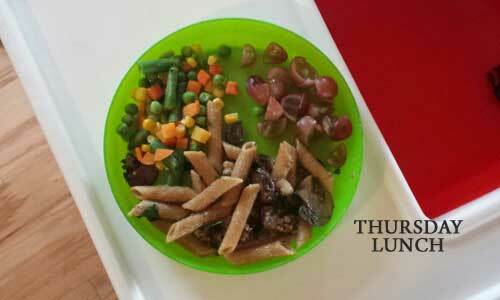 Thursday Lunch: Leftover beef strogenoff, mixed vegetables, and cut-up grapes. 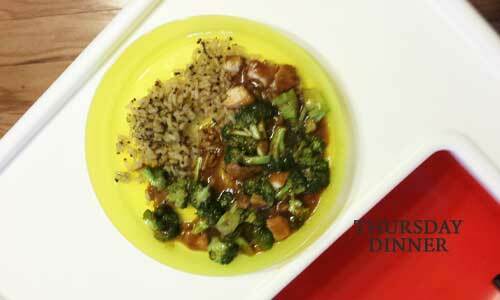 Thursday Dinner: Chinese chicken and broccoli and Uncle Ben's Ready Rice, Whole Grain Medley Quinoa & Brown Rice. Thursday Snacks: Dried cranberries and cut-up string cheese // tortilla strips, plum slices, and whole milk shredded cheddar cheese. She also snacked on whole wheat crackers and dried mango. Friday Breakfast: Egg, potato, and chorizo taco. 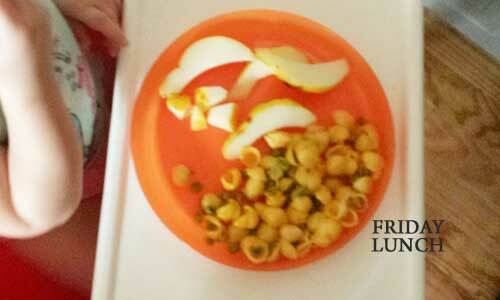 Friday Lunch: Annie's Homegrown Totally Natural Shells & Real Aged Cheddar Mac & Cheese and peas and pear slices. Friday Dinner: Salsa and chips, Mexican beans and rice, and chile verde chicken enchiladas. 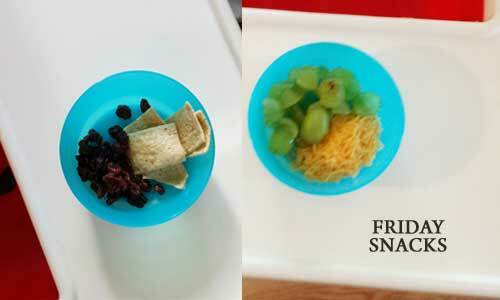 Friday Snacks: Dried cranberries and lentil chips //cut-up grapes and whole milk shredded cheddar cheese. 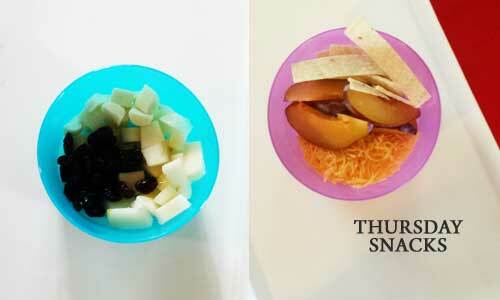 She also snacked on dried mango and NurturMe Yum-a-Roo's Caribbean Crop Baby Snacks. 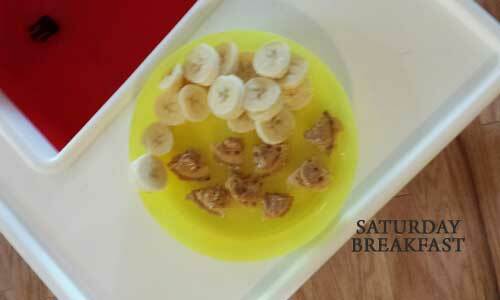 Saturday Breakfast: Whole Wheat Mini Waffles, peanut butter, and banana slices. 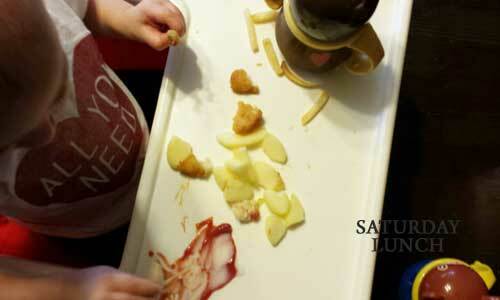 Saturday Lunch: McDonald's french fries, chicken nuggets, and apple slices. 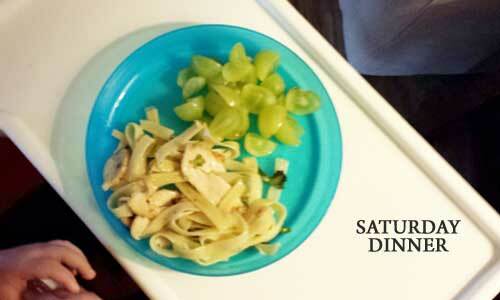 Saturday Dinner: Leftover chicken fetticini alfredo and cut-up grapes. 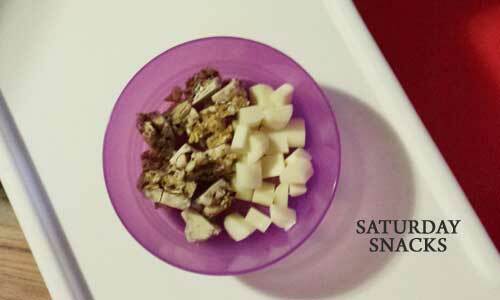 Saturday Snacks: Cut-up string cheese and granola bar. 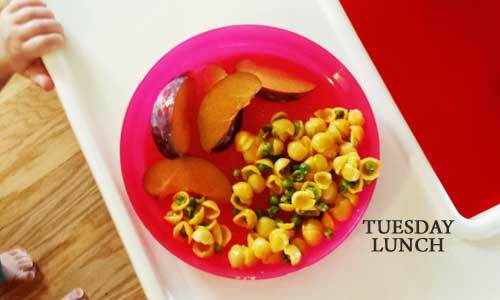 She also snacked on dried mango and NurturMe Yum-a-Roo's Caribbean Crop Baby Snacks. Wow. 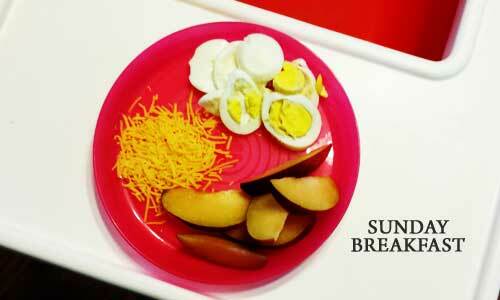 So that's what my kid used to eat in an average week. I say “used to” because, after looking back through the photos/meals, I made some adjustments to her menu. Specifically, I added more veggies and protein. 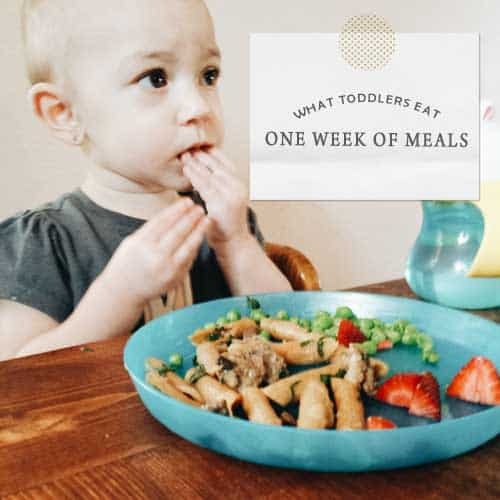 For veggies, I now offer her a fruit + vegetable food pouch at least once a day and also made up a veggie packed marinara sauce form my favorite baby food cookbook that I mix with whole wheat pasta or offer as a dipping sauce. I added protein (for my not a big meat eater) by making sure that a few of those fruit + vegetable food pouches are the kind with Greek yogurt mixed in. I also make a point to stick spinach in anything I can. One more note, I do offer my daughter a lot cheese but she doesn't have digestive or constipation issues so I'll continue to do it. How about y'all? 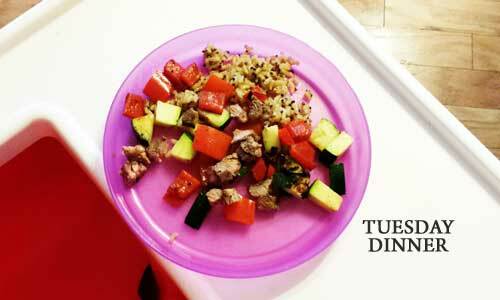 What do you feed your toddler?